As the general public’s knowledge of Japanese knotweed (Fallopia japonica) and the issues it causes continue to rise, we find that there is one persistent and resolute piece of misinformation or miscomprehension that persists. That is, how the plant actually spreads. In order to understand this, we require a quick plant physiology lesson. Japanese knotweed is a vigorous, hardy, perennial plant (a plant that lives for more than two years consecutively) with shield-shaped leaves (young leaves sometime heart shaped), purple-spotted bamboo-like stems and small, creamy white flowers, which appear very late in the summer. It is not native to the British Isles and as such it is not exposed to any of the controlling organisms that maintain it to its natural extent in its countries of origin (i.e. Japan, Korea and parts of China). Follow this link for guidance on Japanese knotweed identification. With the absence of controlling organisms (such as bacteria, fungi and invertebrates) and climate, the plant has been able to spread unchecked across Britain. Often, this has been at the expense of native species in biologically diverse and sensitive habitats. Knotweed is a dioecious plant, in other words there are separate male and female plants. Only the female plant has been recorded to date in the UK, therefore even where Japanese knotweed seeds are produced, they have not been fertilised by the same species, and are sterile and unable to produce new plants. However hybridisation, the process whereby a plant is able to breed with an individual of another species, is possible with Japanese knotweed. In the UK two species closely related to Japanese knotweed are giant knotweed (Fallopia sachalinensis), a much taller plant which can reach a height of 5m; and a smaller compact variety (Fallopia japonica var. compacta), which grows to a height of only 1m. The hybrid (Fallopia x bohemica) is a cross between Japanese knotweed and giant knotweed, and is found throughout the UK, but is not as common as Japanese knotweed. 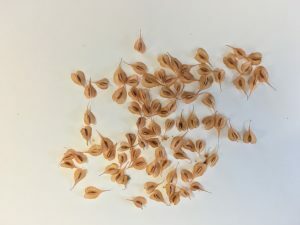 Hybridisation is rare, requiring both species in the same area for cross pollination to occur, and when produced these hybrid seeds rarely survive due to a lack of hardiness – therefore we can say that wind dispersal of Japanese knotweed seed is quite rare. So if wind dispersal is not the culprit, how does Japanese knotweed spread? Japanese knotweed exhibits vigorous growth through the soil from a fibrous rhizome (creeping root system, much like underground stems). Soil can be contaminated with reproductive knotweed material up to a depth of 3m and a radius of over 7m (or wider in certain instances) from the main clump of stems. The rate of growth is very rapid. Consequently, Japanese knotweed can quickly colonise large areas of land if not controlled. Japanese knotweed spreads by disturbance and spreading of the root system that stimulates re-growth. It is often quoted that a fragment weighing just 0.7g can produce a new plant. Therefore the main culprit in the spread of Japanese knotweed is the inadvertent transportation of soils containing rhizome fragments. It is therefore vital that if you suspect you have Japanese knotweed you should get specialist advice as soon as possible. The mere presence of Japanese knotweed in or even near domestic gardens is making it problematic to get a mortgage, and therefore buy and sell property. Under various legal instruments, if the infestation is left unmanaged and untreated, the problem could lead to potential legal action as it has been identified as an antisocial annoyance or nuisance and could cause blight to property and/or a neighbourhood. The popular press has picked up on a landmark legal ruling in which Phlorum recently provided expert witness services. It revolved around two claimants in South Wales who were suing Network Rail for knotweed encroaching onto their properties (you can read about it here). The judgement ruled against Network Rail, who were required to pay damages for the impact their knotweed had on the value of the claimants’ properties. The result will particularly resonate with anyone who owns land that could be affected by knotweed. It is now much more likely that the mere presence of knotweed close to, and not necessarily on, a property will result in a successful claim for damages. Going forward, homeowners and building developers will need to be aware of exactly how Japanese knotweed might spread and affect theirs and their neighbours’ properties. Phlorum is one of the UK’s leading specialists in Japanese knotweed removal, with offices across the UK, including Brighton, Manchester and Cardiff. We offer our services to both domestic and commercial clients from anywhere in the UK and Ireland.